Brooklyn Nets guard Joe Johnson drives against the Miami Heat’s Norris Cole. Brooklyn Nets guard Joe Johnson drives up against Miami Heat guard Norris Cole. After the Brooklyn Nets’ dramatic victory in Game 7 of the first round of the NBA playoffs on the road (itself a rare feat), the team’s next challenge will be facing the defending champion Miami Heat. The Heat are favored, with opening lines giving them around an 85 percent chance of advancing — and they’re relatively close to even money to take home their third consecutive championship. Miami’s 54-28 regular-season record was 10 games better than Brooklyn’s 44-38, and its 4.15 SRS (margin of victory adjusted for strength of schedule) led the East, while Brooklyn’s -1.58 SRS isn’t even better than average. Brooklyn mainly has one thing going for it1: The team swept its regular-season series against Miami, winning all four games. Now, three of those four were decided by one point each, and the other went to double overtime, so it’s not as if the Nets had the Heat completely locked down. 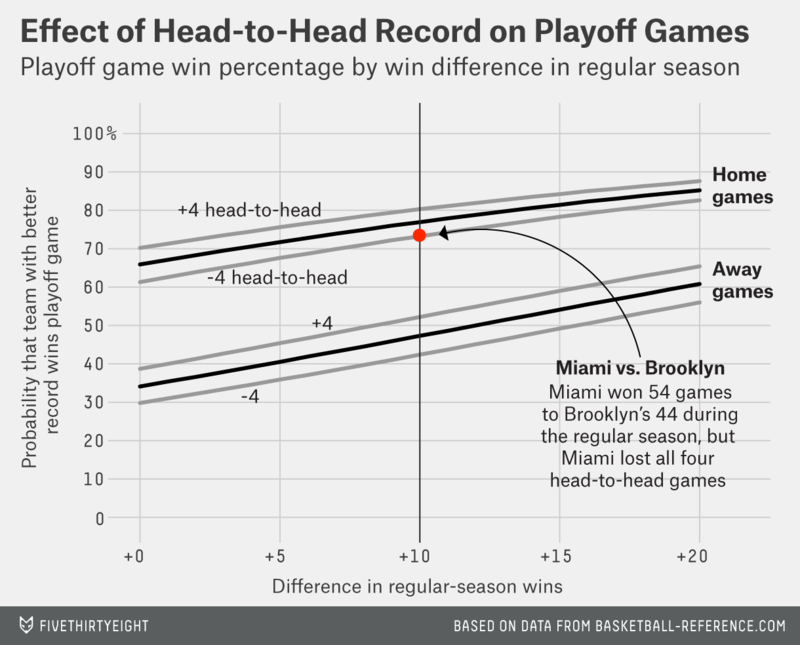 Still, if some teams match up better against certain teams than against others (independent of their relative strength), a result like this would make it more likely that Brooklyn is better — at least against Miami — than we might have thought. Intuitions about the importance of such head-to-head records vary substantially: Some commentators and experts cite them liberally, while some stats types dismiss anything that’s based on so few games and/or that doesn’t regard every sport as a weighted random walk. The truth is that there’s a real and demonstrable value of head-to-head record relative to a team’s record against other teams. But that value is limited. While Brooklyn winning four games out of four sounds impressive, it’s only two games above what we would expect to happen by chance. So to have any kind of significance, the relative importance of head-to-head results must be substantially higher than comparable results against other opponents. That is, if “matching up well” is a real thing. And if it is, it should be a measurable statistical phenomenon. Which it is. Whether the team is playing at home (1 for home, -1 for away). How well the team did against its opponent in regular-season games. The exact calculation of this is complicated,4 but functionally it just means the difference in number of wins. The difference between the teams’ records against all other opponents.5 Essentially, the number of games above .500 one team wins (excluding games against its opponent) minus the number of games above .500 of the opponent (again, except for games against the first team). Using the coefficients from that regression output, we can create a logistic function8 to tell us the odds that a team with given relative strength will win a particular playoff game. So depending on how strong the favorite is, going 4-0 against that team in the regular season can gain the opponent up to a 5 percent better chance of winning a particular playoff game than if the teams had gone 2-2 against each other, and an almost 10 percent higher expectation of victory than if the opponent had gone 0-4. Compounded over the length of a series, this is enough to have a pretty significant effect on who advances and who doesn’t. Finally, we can check how well our series estimates perform against actual results by running the same empirical analysis as above, except on series outcomes. The head-to-head effect (though based on a smaller sample) actually appears to be a bit bigger than what we would expect from the effects we saw in individual games. A record of 0-4 can decrease a team’s chances of winning its series by up to 25 percent, while the opposite is true if the record is 4-0. Whether or not you find these results surprising, it’s clear that the effect is nowhere near strong enough to take a 10-game dog and make it a favorite. So no luck for the Nets, at least not from this angle. Well, sort of two: In calendar-year 2014, regular season and playoffs combined, Brooklyn is 38-20 while Miami is 34-21 (of course, that timeframe is cherry-picked). Our natural tendency is to weight recent performance more heavily than earlier performance, but outside of major injuries and trades, there’s not a lot of evidence for this approach’s accuracy in the NBA. 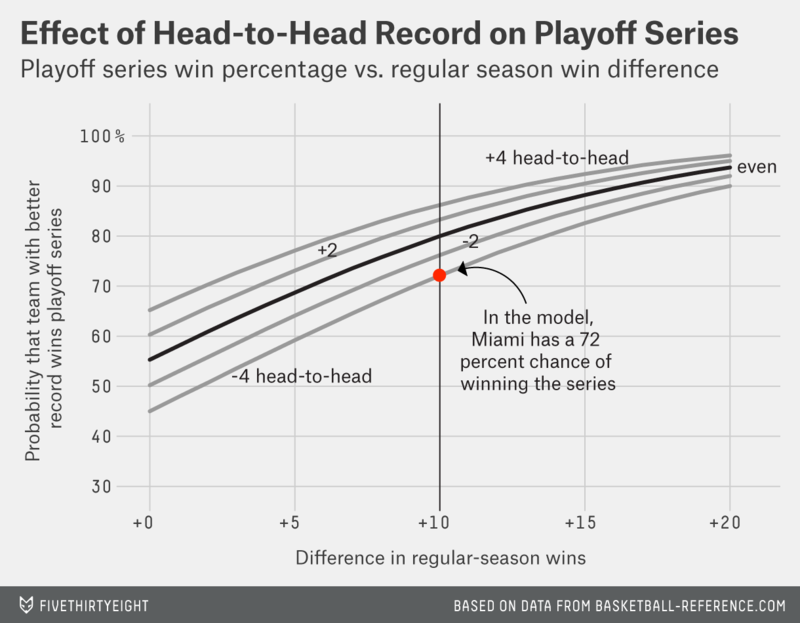 The importance of head-to-head record to predicting game outcomes can be measured in either regular-season or postseason contexts, but focusing on the playoffs simplifies the problem for a couple reasons: 1) Since all regular-season games come before the playoffs, you don’t have to do tricks like using future games to predict present ones; 2) Most regular-season head-to-head records in recent years are out of two or four games with an equal number on the road or at home (with only a minority at three games with one extra home or away). This makes it easier to avoid potential home-court skew. The kind of regression most commonly used to predict binary outcomes like wins and losses. For regression purposes, we have to account for series that have a different number of games at home and on the road, so these win differences are actually measured against each team’s expectation given any such advantage it might have. I should note that whether you make this adjustment or not, or even whether you just exclude unbalanced series, the relative value of head-to-head versus other games comes up almost the same. The adjustment allows us to increase the sample size, making the results more robust. Also slightly adjusted for any home/away imbalance. The two main numbers to observe are the 0.2085 coefficient for H2H_win_difference (in scientific notation as 2.085e-01) and the 0.05478 coefficient (as 5.487e-02) for Not_H2H_win_difference. You also get similar relative weights if you perform this analysis on margin of victory or some variant thereof (though that analysis is a bit trickier). This is the equation generated by the logistic regression above that we use to predict game outcomes. In Excel it looks like so: =1/(1+EXP(-([Intercept]+[HomeCoefficient]*[h]+[H2HCoefficient]*[H2H_win_difference]+[NotH2HCoefficient]*[NotH2H_win_difference]))). In recent years teams play four games against each other at most during the regular season. So if you had that information and someone else didn’t, it would be enough for you to beat the vig betting against him in a sportsbook, easily. While it’s obviously a small sample, this is really a fascinating result: Close series are theoretically exactly the ones where we tend to think home-court advantage would be really useful. 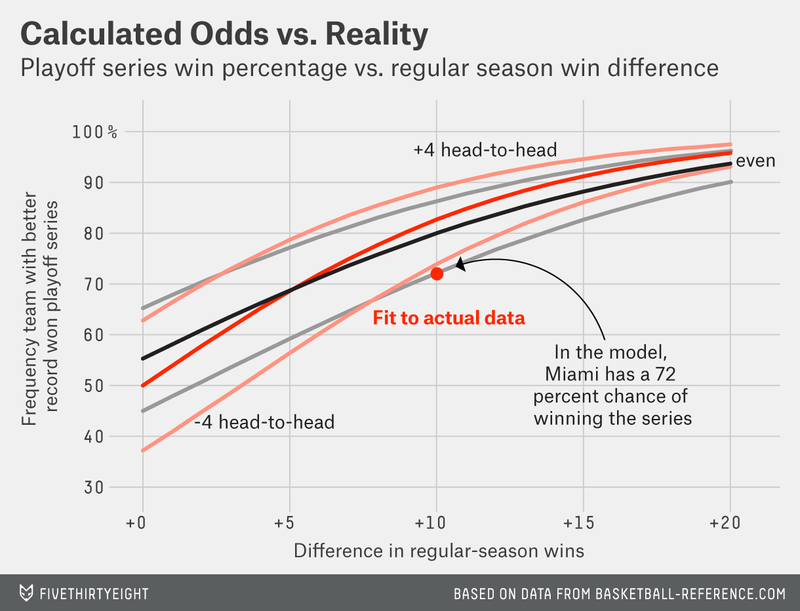 The multitude of ways that NBA playoff series don’t track with estimated/simulated/calculated projections is a continued source of fascination for me.